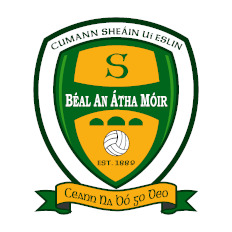 Nollaig Shona romhaibh go léir –On behalf of all at Seán Ó hEislin we would like to take this opportunity to wish you all a Happy Christmas and thank you for the support you have given us throughout the year. U16 Ladies Championship Final – Hard luck to our U16’s who lost out on a scoreline of 2-9 to 6-4 against Glencar Manorhamilton on Friday night. The girls played some fantastic football in the first half especially but went in level at the break despite dominating the play for long spells. Against the wind, it proved a much tougher task in the second spell and Manor took full advantage to lift the cup for the fifth year in a row. Our girls did the club proud and had a brilliant season. Numbers Drawn 2 7 6 4 3 0 5 1. House Draw: Padraig Mac an Phriora. There will be no lotto draw on the 24th, 31st of December or the 7th of January.